Ke Nani Kai is a condominium resort complex of 120 apartments whose owners have formed an Association of Apartment Owners (AOAO). The AOAO employs a staff who are responsible for the maintenance and general operations of the resort including the exterior of the buildings and the common areas such as the pool, the tennis courts, and the barbecue area. The Ke Nani Kai Time Share Association also known as The Club is made up of 357 owners. Each owner has a fee-simple deeded interest in a one or two bedroom suite/condominium. The Club has its own Board of Directors who meet regularly and oversee the operation of the organization. Ke Nani Kai is affiliated with the INTERVAL INTERNATIONAL EXCHANGE network with over 2400 resorts worldwide to trade into. Annual membership dues are $89 and exchange fees are $174. II offers many benefits for KNK Owners including special promotions like two-for-one trading, discounted Getaway Vacations and a full-service travel agency with below-market rates to key destinations and online serviceability. 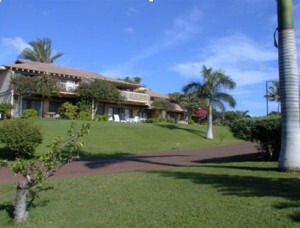 Ke Nani Kai also has an IN-HOUSE EXCHANGE SERVICE exclusively for KNK owners. We have a 98% success factor in confirming owner exchanges. There are no membership fees or upgrade fees to larger sized units. A nominal exchange fee will be charged only after your request has been confirmed. We can book you into the most exciting vacation destinations in Hawaii, Mexico, Canada, and various other locations. Give us a call for all your exchange needs. We offer 30 years of expertise in the exchange business and will provide you with individualized quality service in securing the space you want. A list of areas and resorts is listed further in this web site. RENTALS & RESALES may be found by viewing the RENTAL and RESALE section of this web page or by contacting the Time Share Office: info@kenanikai.com or call toll free 1-800-490-9042 or 858-679-2016 or FAX 858-679-2017. Our consultants will be in your area. We will be making offers on timeshares. If you are contacted by such a company and they request an upfront fee for any kind of service, it is likely to be a scam. A good rule of thumb, NEVER PAY AN UP-FRONT FEE (no matter what they call it – an appraisal, a market analysis, marketing, advertising, or listing fee). For accurate information on the latest timeshare scams, visit the ARDA website (American Resort Development Association based in Washington DC): www.arda-roc.org. You can register on this web site for e-mail notifications of fraudulent practices and companies. Beware of high-pressure sales tactics when visiting exchange resorts. When visiting a resort that has an active sales force such as a Diamond Resort, you may be pressured into attending a sales presentation. YOU ARE NEVER REQUIRED TO ATTEND A SALES PRESENTATION at any resort destination. To entice you, the salespeople offer free gifts and special incentives to get you into the presentation room. They often try to convince you to “trade in” your existing timeshare to purchase one at their property. They may promise a large discount as the “trade-in” value. An ADRA investigation revealed that many of these “trade in” deals did not properly transfer the “trade in” property, and if they did, it was to an asset-less LLC. Note: The Ke Nani Kai Club does not provide your personal information to any outside organization.